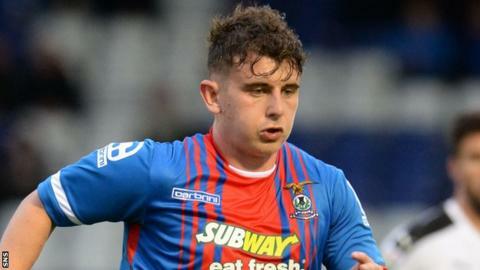 Inverness Caledonian Thistle have extended the contracts of Aaron Doran, Alex Fisher and Lewis Horner after missing out on striker Miles Storey. Winger Doran has signed a two-year contract, with the club holding the option of adding another year. Midfielder Horner has earned a new one-year contract. And striker Fisher, whose season was finished early by injury, has been given a six-month contract that the club can extend for another year. The Englishman joined Caley Thistle after leaving Torquay United in December but made only three appearances before chipping a bone in his ankle. Fellow 25-year-old Doran has not played since his first appearance of the season - in their Europa League qualifying defeat by Astra in July. The Irishman, who first signed in 2011 after leaving Leyton Orient, picked up a knee injury in pre-season but has recently returned to fitness. English 24-year-old Horner, who joined Caley Thistle after leaving Blyth Spartans in 2014, broke into the first team this season and has made 18 appearances. Manager John Hughes had made one of his priorities the retention of Storey, who scored 13 goals in 37 appearances for Caley Thistle while on loan from Swindon Town. However, the striker has agreed to join Scottish Premiership rivals Aberdeen after rejecting offers from Caley Thistle and the English League One club. A club statement read: "Due to Miles Storey's age and the transfer regulations, we were unable to speak, or make an offer, to him until very recently. "The club made the best offer we could, but Miles has decided that his future lies elsewhere." Storey becomes the second player this week to leave Hughes' squad, with midfielder Nat Wedderburn having agreed a deal with Dunfermline Athletic, who have been promoted to the Championship. Caley Thistle have also offered new contracts to goalkeeper Owain Fon Williams and midfielder Iain Vigurs. The club state that two pre-contract targets presently with other clubs also "remain a work in progress". Abdul Osman rejected Hughes' approach and decided to stay at Partick Thistle, but two of his fellow Thistle midfielders - Stuart Bannigan and Steven Lawless - are also wanted by Inverness. Firhill manager Alan Archibald said last week that he had hopes that Lawless and defender Frederic Frans will sign new deals but admitted he is resigned to losing Bannigan and centre-half Danny Seaborne. Meanwhile, three 19-year-old members of Caley Thistle's under-20 squad have earned professional contracts - midfielder Jason Brown, goalkeeper Cammy Mackay and forward Ali Sutherland.